•Featuring the sounds of DJ-CK( http://www.dj-ckonline.com/ ) •Light Hors d'Oeuvres •Complimentary wine and dessert bar. 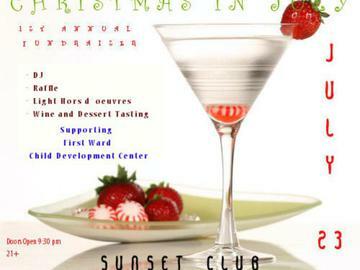 This "Christmas In July" celebration we're supporting the First Ward Child Development Center. A percentage of proceeds collected will be used to purchase book bags and school supplies for the school. We're also collecting school supplies. Festivities begin at 9:30pm. 21+ permitted. We request your most stylish upscale attire. For all additional questions please contact rickmondmedia@gmail.com. Complimentary & Valet parking available.